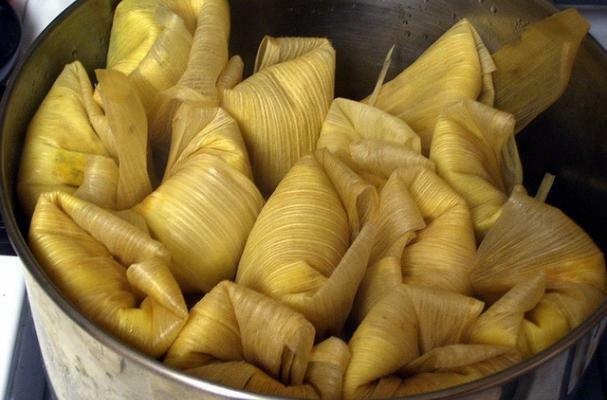 Mexican culinary tradition dictates that Christmas is a time to make tamales. I have known many Mexican families in my life and from what I have been able to pick up over the years, it's a family affair. Women (aunts, daughters, sisters, friends) gather around the table and spend the day, maybe two, preparing tamales. At first, tamales can seem like a daunting task with its many steps and unfamiliar ingredients but when they are finished you will feel satisfied and accomplished. Each one is like a present that you literally open up and devour its contents. A previous post was written about tamales with an informative tutorial to help the novice cook. This year take the plunge and make your own batch of tamales. To me, Christmas is never complete without a few homemade tamales. Soak corn husks overnight to soften. Throw the small husks away and lay out larger husks in a pile; set aside. Make a paste with the ancho chiles, oregano, cumin, onions, garlic and salt and spread over pork. Place pork in a roasting rack and cook in a 350 degree F oven until done; about 1 hour. Reserve the broth when meat is done. While meat is still warm, pull the pork apart into strings. Beat lard until fluffy, then add to the masa harina with salt and broth from pan drippings (if the meat was too lean and there are no drippings, add a bit of chicken stock to moisten). Mix until it is the consistency is like thick cake batter. Assembling the tamales: Spread about 3 tablespoons of the masa mixture in the center of a corn husk about 1/2-inch thick. Place 1 large tablespoon of the meat in the middle, lengthwise. Fold the husk over the filling, allowing the plain part of the husk to wrap about the tamale. Fold the bottom end up over the enclosed filling. Arrange the tamales upright in a steamer basket or large dutch oven with the water about an inch below the tamales. Simmer for about 2 1/2 hours or until tamales are firm and fall away from husks. Don't crowd the tamales.